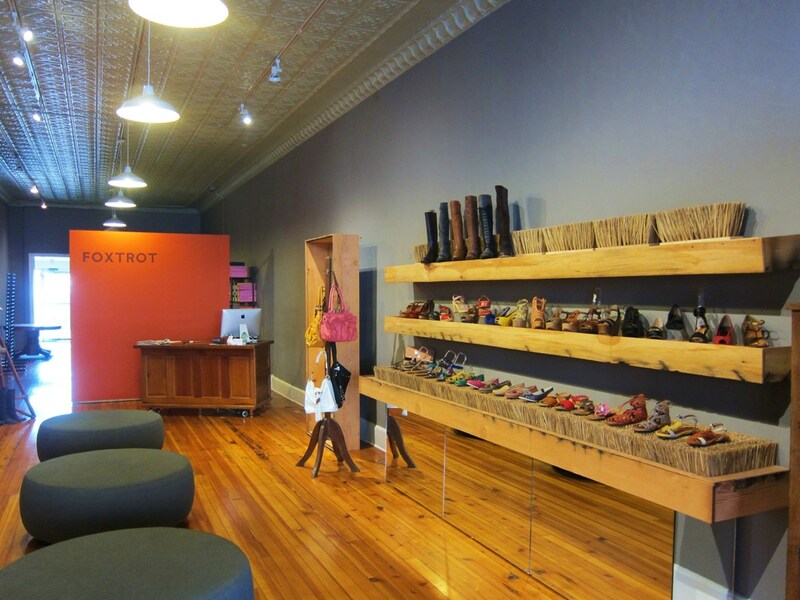 No city is complete without a stylish, local shoe boutique. It adds some sass to the downtown streets, and provides a sure dose of refreshment for any shopper who cares to slip into a new sole. Such is the precise case for the happy shoe shop on Mass St, Foxtrot. 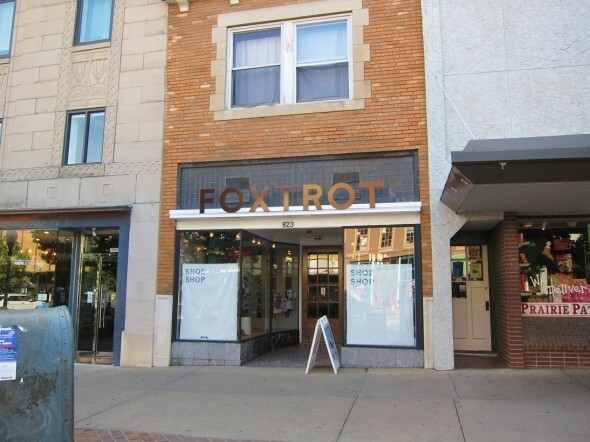 Foxtrot carries men’s and women’s shoes, as well as fun socks and stylish purses. Here you can find mostly fashion shoes, ranging from sky-high wedges to sweet boat shoes and cool summer sandals to hardy winter boots. I have made my fair share of visits to this petite shop, and surely did a few double-takes while perusing the cool kicks neatly displayed along the shelves. Foxtrot's window displays are my favorite in town. 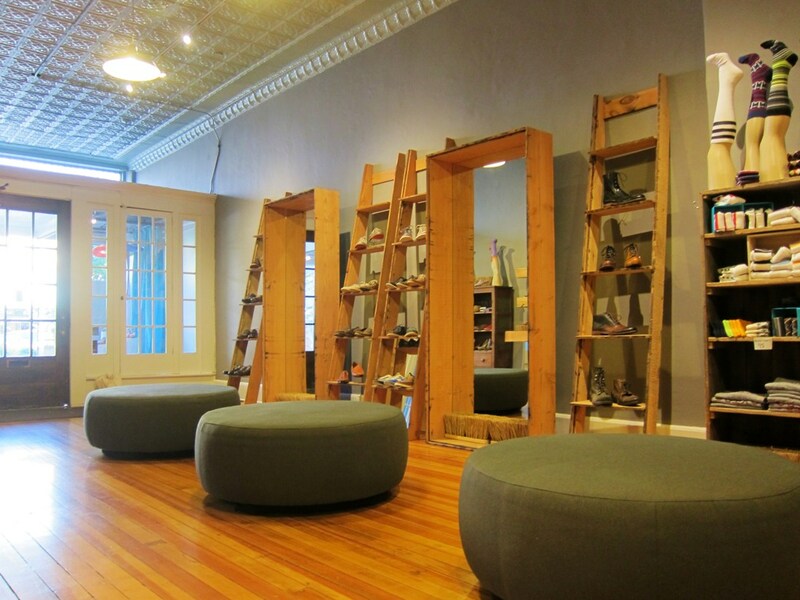 It's a chic, no-fuss kinda shoe boutique. Quite the treat! 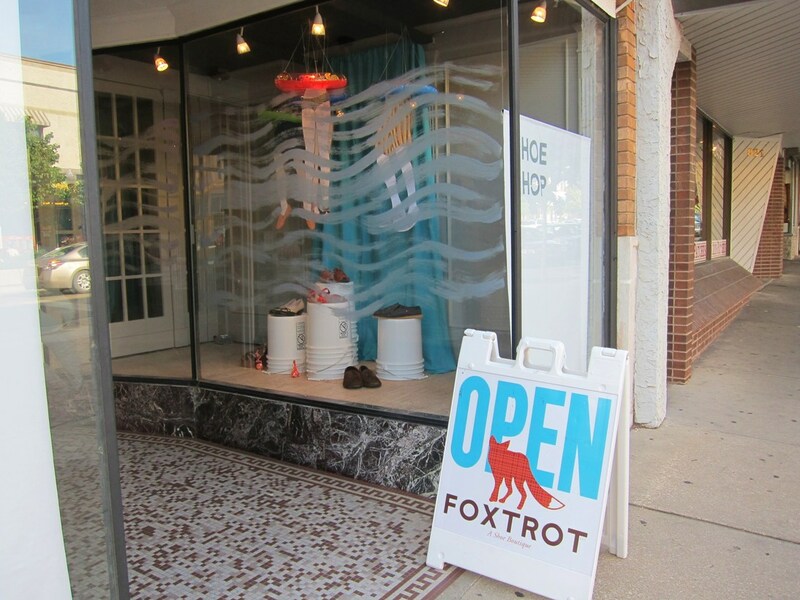 When walking along Mass, you’ve likely noticed Foxtrot’s spunky, ever-changing window displays. They always catch my attention, and take me away from the world for a good few seconds while I admire the creativity and novelty of their presentation. Currently, you’ll find some swimmers’ legs dangling in the front windows; it gives you the impression you’ve just canon-balled into a pool and are soaking in the few seconds underneath the water before coming up for air. And the little treasures beneath the water – shoes! – keep you good company until then. Good space to slip on some new shoes and strut. The leopard Seychelles I walked away with. During my last visit a week ago, in which I was honestly stopping in to “visit” a recent favorite pair of wedges (admit it, you do it, too), I ended up leaving with them, and am happy to give them a new home. I picked up these leopard wedges on sale for $70.75 (after tax)! The brand is Seychelles and my feet feel like they’re snuggled up in a thick down comforter when I walk around in them. While I highly recommend visiting the store in person (the experience is so pleasant), shoppers can also check out the footwear online (and it’s quite the user-friendly website, too). You’ll notice that there’s a special running for this month: free shipping! Hey hey! I hope you take a gander, whether in-person or online, and buy your feet a little stylish vacation for the summer. Foxtrot is open Tuesday, Wednesday, Saturday 10-6; Thursday & Friday 10-7; Sunday 12-4. This entry was posted on Sunday, June 10th, 2012 at 8:48 pm. It is filed under Businesses and tagged with Foxtrot, leopard print, shoes, shopping. You can follow any responses to this entry through the RSS 2.0 feed.